This report details the results of a NIOSH investigation on the ability of the Coal Dust Explosibility Meter (CDEM) to accurately predict the explosibility of samples of coal and rock dust mixtures collected from underground coal mines in the U.S. The CDEM, which gives instantaneous results in real time, represents a new way for miners and operators to assess the relative hazard of dust accumulations in their mines and the effectiveness of their rock dusting practices. The CDEM was developed by the National Institute for Occupational Safety and Health (NIOSH) and successfully underwent national and international peer review. The intention of the device is to assist mine operators in complying with the Mine Safety and Health Administration (MSHA) final rule 30 CFR 75.403, requiring that the incombustible content of combined coal dust, rock dust, and other dust be at least 80% in underground areas of bituminous coal mines. As a final step towards commercialization of the CDEM, and to evaluate the performance of the device as a potential compliance tool, NIOSH undertook an extensive cooperative study with MSHA. This study, completed in 2009–2010, involved field use of the CDEM within MSHA’s 10 bituminous coal districts. As part of their routine dust compliance surveys in these districts, MSHA inspectors collected sample coal and rock dust mixtures, field testing these samples for explosibility with the CDEM. Samples were then sent to the MSHA National Air and Dust Laboratory at Mt. Hope, WV, for parallel testing, first using a drying oven to determine the moisture followed by the traditional low temperature ashing (LTA) method. The LTA method determines explosibility of a coal and rock dust sample in a laboratory by heating the mixture to burn off the combustible material. The results, when combined with the moisture, are reported as total incombustible content (TIC). If the TIC is ≥ 80%, the sample is deemed to be nonexplosible and compliant with 30 CFR 75.403. In the field component of this study, MSHA’s use of the CDEM indicated that 30% (175) of the 591 samples collected were explosible. NIOSH was able to obtain and remeasure 297 samples, and 97% of those identified by the CDEM as being explosible (27% of samples) or nonexplosible (73% of samples) correlated with the results of the subsequent lab analysis using the LTA method. Of the remaining 3% where there were differences between the field and laboratory methods, subsequent NIOSH evaluation attributed these differences to the variability (incomplete mixing, inadequate drying of the sample, the particle size of the rock dust and/or coal dust) of the samples being analyzed, the retained moisture in those samples, and the inherent ash in the coal. In considering these results and comparing the CDEM field measurements to the LTA laboratory measurements, it is important to understand the fundamental distinctions between the two methods. The determination of TIC by the LTA method is not itself a direct measure of explosibility, but a surrogate that calculates a single parameter associated with full-scale experimental results. This method is not based on particle size and treats all particles equally regardless of the size. In contrast, the CDEM utilizes a different approach, using optical reflectance to determine the ratio of rock dust to coal dust in a mixture, with full-scale experiments on flame propagation having already demonstrated the effects of varying the coal dust particle sizes and incombustible concentrations on the explosible vs. nonexplosible dust mixtures. A final important distinction between the two methods is that the CDEM offers real-time measurements of the explosion propagation hazard within a coal mine entry, allowing for immediate identification and mitigation of the problem, while the results from the traditional LTA method are not known for days or weeks after a sample is collected, allowing for the deficiency in rock dust to continue. The conclusions of this study strongly support the field use of the CDEM to measure the explosibility of coal and rock dust mixtures, to more effectively improve the onsite adequacy of rock dusting for explosion prevention. Mine operators could use the CDEM on a regular basis to ensure that their rock dusting practices are achieving inertization requirements and meeting the intent of 30 CFR 75.403. MSHA inspectors could use the CDEM as a tool to immediately identify onsite explosibility hazards and initiate corrective action. A critical issue to both the LTA and the CDEM analysis methods is that the results are dependent on representative samples being collected for analysis. Harris ML, Sapko MJ, Varley FD, Weiss ES . 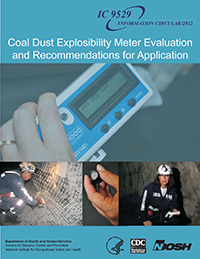 Coal dust explosibility meter evaluation and recommendations for application. Pittsburgh, PA: U.S. Department of Health and Human Services, Public Health Service, Centers for Disease Control and Prevention, National Institute for Occupational Safety and Health, DHHS (NIOSH) Publication No. 2012-172, IC-9529, 2012 Aug; :1-53.